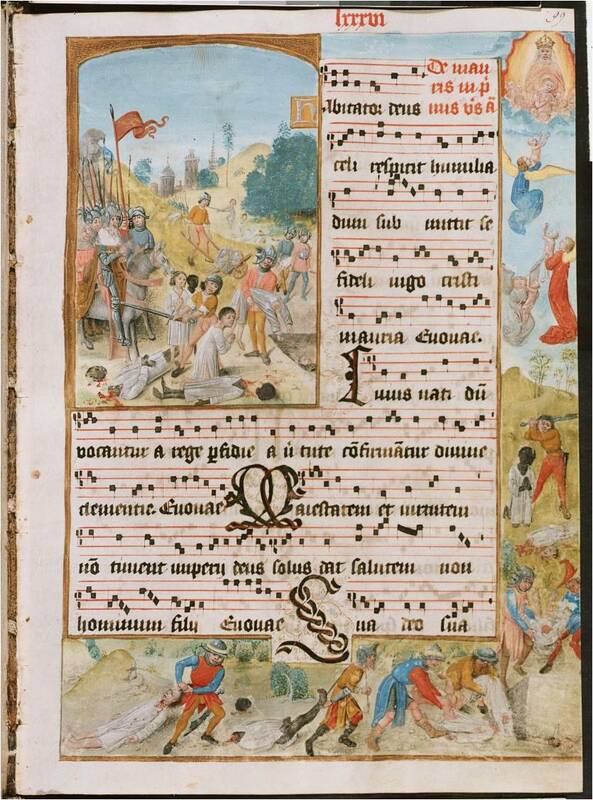 The majority of verses and homilies in this missal were written in honour of Saint Maurice and his Theban martyrs. According to legend Saint Maurice was a commander of one of the Roman army’s Theban legions in the third century AD. While serving in what is now Switzerland with other Roman troops engaged in fighting the much feared Gauls, Maurice and his soldiers, all converts to Christianity, refused to take part in pagan Roman practices. Emperor Maximianus Hercules’ response was to execute the entire legion in AD 287. 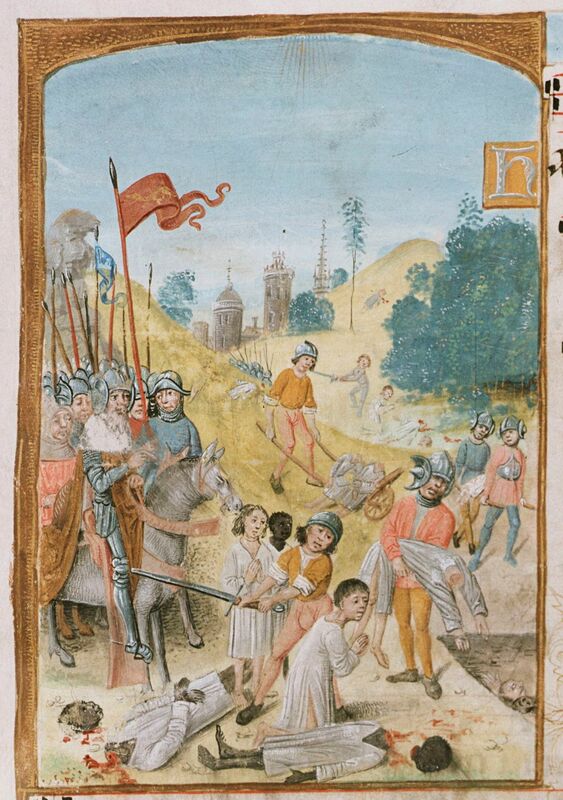 You can see in the upper left corner of the miniature black Thebans being beheaded by white Romans. The main figure appears to have a slightly lighter skin than his fellow legionaries who have already lost their heads. 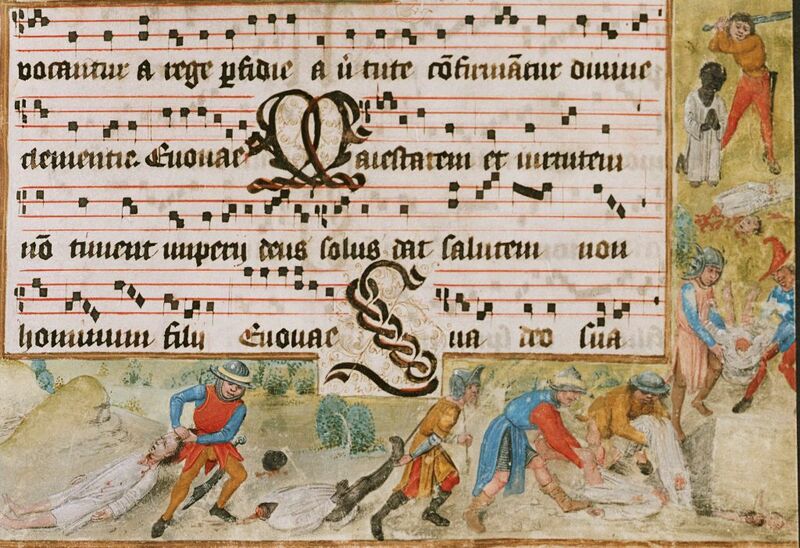 The torment continues in the margin decoration. Upper right the previously black Christians ascend to heaven as white angels. The Latin text refers at length to Maurice’s black skin and the African origins of himself and his army. A conspicuous feature of this miniature is that the legionaries carry no weapons or equipment and are simply dressed. This is unusual in representations of Saint Maurice who is generally clad in showy garments and armed with a sacred spear. The simplicity of the figure’s clothing in the Bilzen missal may have been determined by the fact that the missal was made for a convent and not for some royal or imperial patron. From the thirteenth century the Egyptian Saint Maurice was depicted with increasing frequency as an African in Roman clothing. 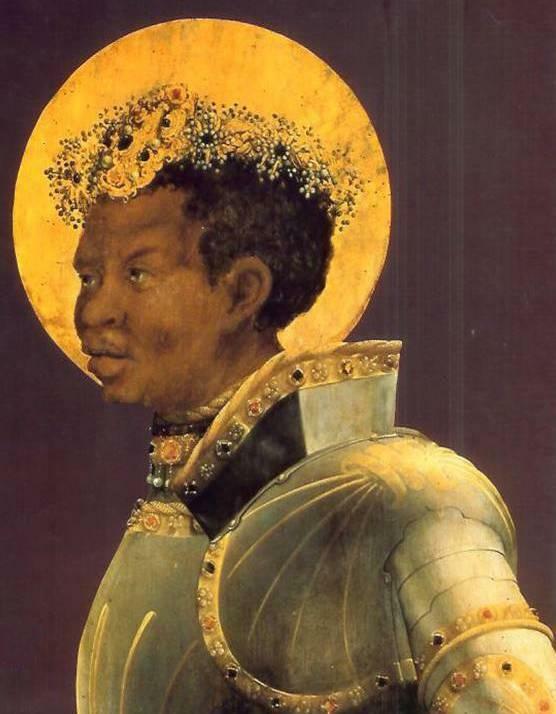 Although his name would have been an influence in this regard, a considerable role was also played by Frederik II of Hohenstaufen (1194-1250) for the Holy Roman Emperor deployed a black Saint Maurice as his symbol of the universal imperial task of bringing the world to the true faith. 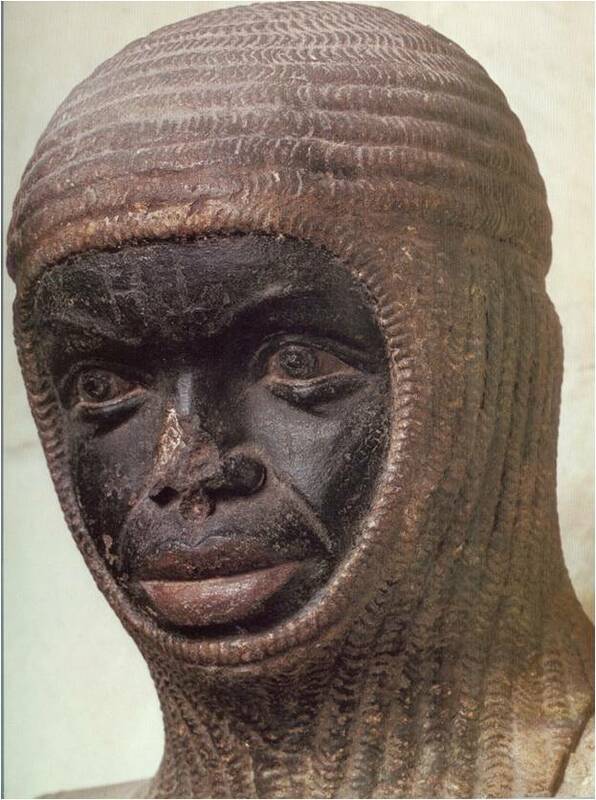 The first representation of Saint Maurice as an African dates from circa 1240-1250 and stands in Magdenburg Dom to which the saint’s relics had been brought in 1220. The cult of black Saint Maurice became extremely popular in large areas of Europe from this time onwards. In the Netherlands black Saint Maurice’s popularity remained modest in comparison with that enjoyed by the saint in Germany. Bilzen, from where this missal comes, lies close to the German border. The cult of Saint Maurice reached its high point in the years from 1490 to 1530, the period in which the missal was made. Saint Maurice is the patron saint of two towns, Bilzen and Varsenare, in what is now Belgium. The manuscript was commissioned by the Augustine convent at Bilzen. Missals are liturgical books used during the celebration of mass. In the catalogue Black is beautiful, Rubens to Dumas (2008) footnotes, literature and more on miniatures and Black Africans. Previous Schiller 8 November lezing, ontbijt en The Making Of…..